James Bond is back! On his latest secret mission. Now you take his part in these three exciting arcade/adventure games taken straight from the film. Your name is Bond - James Bond, the world's top Secret Agent, and now embarking on one of the most important missions of your career. Your name is Bond - James Bond, the world's top Secret Agent, and now embarking on one of the most important missions of your career. To fail is the worst thing that can happen to you. Your objective is to discover what dastardly plan is being hatched by Max Zorin, an unscrupulous European electronics magnate, and prevent him from carrying it out. You learn that the information you need is in three main locations. Paris, where you must make contact with May Day to get a vital clue. The City Hall in San Francisco, where various secrets are hidden, and finally a Silver Mine under Silicon Valley, where you piece together your information and finally foil Max Zorin - we all hope! 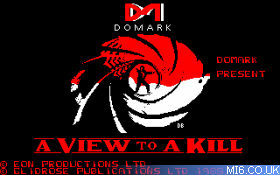 "A View To A Kill" was released on 7th June 1985 by a company named Domark - named after it's founders whose names were Dominic and Mark. The company no longer exists after it was bought out along with United States Gold & Core design and became part of the Eidos video game company which still exists today. The game is split into three different sub-games - one of the first titles to usher in the (soon to be common) "multi genre" movie-tie in videogame. The first chapter uses a very basic 2D / 3D hybrid driving system, the second is a room-to-room scrolling walk around (much like the popular "Spy Vs Spy" games), and the third chapter is a sideways-scrolling romp around. On paper this sounds like a great way to cover three of the movie's key sequences ("Paris Chase", "City Hall" , and "Silicon Mine" respectively) but the end result can only be described as a rushed, buggy and disjointed mess. Bugs are most prevalent, and most annoying, in the opening "driving" chapter. Collision detection was something of a young art at the time of the game's release, but this is still no excuse for the head-scratching moments that cause your car to crash for no reason or stick to a wall. The aim is to follow Mayday on the radar whilst avoiding Parisian traffic. Either would be a challenge, but both simultaneously is too much for the poorly developed game engine. The second chapter fairs slightly better, but the flawed "duck shoot" menu system ruins the gameplay. This poor menu device also plagues the third chapter, which is the simplest of the lot, consisting of Bond running to find, and defuse, the mineshaft bomb. However dreadful the gameplay may be, the game is not without it's saving graces. 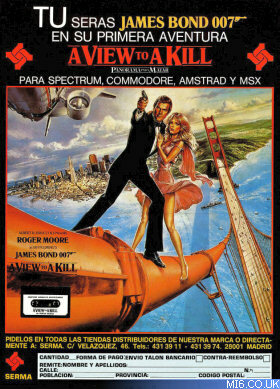 The music is where "A View To A Kill" offers it's only noteworthy feature, with a fantastic (for the time) rendition of Duran Duran's movie theme for two of the chapters, and a variation on the Bond theme accompanying the other. You only get to enjoy this on the C64 version though, as the Amstrad has no music at all, and the Spectrum only has a short Bond theme at the intro. Sound effects are dreadful too, with the Spectrum making Bond's car sound like a wind-up toy. Even the the voice-synth quotes (which were quite cutting edge for the mid-80s) grate on the speakers. A gruff voice says "Bond, James Bond" at the intro, and "Damn it, you failed Bond!" upon the frequent "game over" screen. Graphically the game is lacklustre, even for it's time and the platforms it was designed for. As usual, the graphics are better on the C64, disappointing on the Amstrad, and dreadful on the Spectrum (the psychedelic colours do nothing for the game's appeal). 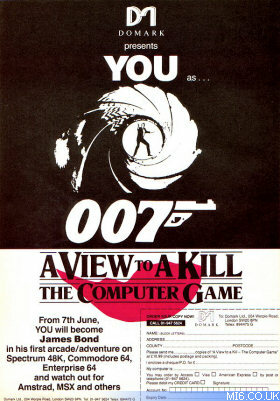 Put simply, "A View To A Kill" looked dated - in 1985. 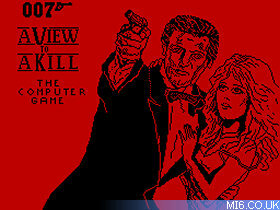 The developers clearly bit off more than they could chew when taking on 007 for the first time as "A View To A Kill" fails to hit any mark. None of the three game chapters work well and are riddled with so many bugs that play becomes too frustrating too quickly. Thankfully, you can play chapters out of sequence (see the level codes below) but players will have to work hard to get anything good out of this experience. At the end of the first two games you'll be given a code which you must type in at the start of each new game. This simply tells the program how well you've done in the last game, and passes over helpful pieces of information. You may play any game at any time, but to be totally successful in the final game you must have done as well as James Bond himself would have! This will become apparent as you play each game. Once you've got the codes, you can always use them again - the numbers are not randomly generated each time. However, you may wish to improve them each time. Each game is played in real time. You're against the clock - and good times are passed on via the code to give you more time in subsequent games. 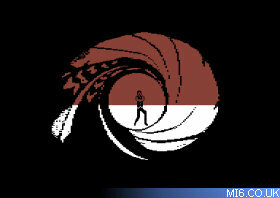 James Bond doesn't exactly die - but he can fail when you play him! He may irrevocably damage his car in Paris - or become engulfed in flames in City Hall. How the real James Bond gets out of these situations without your help (some might say interference!) is left to your imagination. Needless to say, he lives to fight another day, and you can try, try and try again. Pause - Select this on your menu, and give yourself a break. Open a bottle of Bollinger Champagne, or light a Davidoff cigar. Sit back for thought, and time will stand still. Abort - So things are a little tricky on this mission and you want a weekend in Acapulco. Select Abort on the menus, press 'fire' twice (not applicable in Paris - you're on holiday anyway) and pack your bags. Music - You have a choice of "The James Bond Theme" by Monty Norman (c) 1962 United Partnership Ltd, reproduced by permission, or "A View to a Kill" by Duran Duran and John Barry (c) 1985 Tritec Music Ltd/CBS Songs Ltd reproduced by permission, at various points in the program. Controls - All games may be joystick or keyboard operated. Speech - You'll hear it at various times - listen out! Above: Splash screens for the Amstrad CPC, Commodore 64 and Spectrum 48K. The scene is set: Bond has been briefed by 'M' and has been instructed to find out what Max Zorin's plot is all about. He has lunch in the Eiffel Tower with a friendly Agent who is killed by May Day. 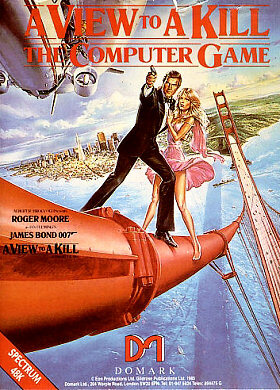 Bond chases her up the Tower, but she hurls herself off the top and parachutes to a drop point in Paris. He leaps onto the top of the Tower lift and commandeers a taxi at the bottom. From then on, you take over.You can follow her movements with the aid of a radio tracker, which indicates her proximity and her altitude, and her shadow will pass over your aerial view. You can see the building in front of you through the windscreen, and your speed, the time and your damage is indicated on the dashboard. Your objective is to reach the correct drop point exactly at the same time she does, but be careful. The winds constantly change, and her direction may alter at any time, landing her on any one of a number of possible drop points. Along your route you will encounter various hazards. The street's one way system is indicated by little yellow arrows, and going against the system may cause the police cars to chase you. Watch out, they may take a pot shot at you! The drivers around Paris are fairly reckless, and the odd Porsche may career into you. There are barriers to avoid, and brushing into buildings will definitely take it out on your blue Renault. Because Bond never travels without a pistol, you can use one here to knock out unwelcome vehicles which may get into your path. Also, being an expert driver, handbrake turns are easy for you, and may get you out of tricky situations! In the event that you fail to catch May Day the game will automatically start again. Maybe you'll have learnt something! If you do well your code will be important for use in later games. It relates your success to the other programs, in a way that you'll subsequently discover. James Bond has traveled to San Francisco in his search for Max Zorin. Armed with the information from May Day, he finds him in the City Hall, but Zorin turns the tables. 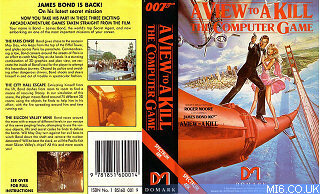 At gunpoint, Bond and his companion, Stacey, are pushed into the lift and trapped between floors. In an effort to finish them off in an "accident", Zorin sets fire to the top floor of the City Hall, and leaves. Bond pulls himself out of the lift and must now get Stacey and himself out of the burning building. You take over at this point. Using the "duck shoot" menu system, you can either move Bond from room to room, or take action, such as searching, using, dropping or issuing commands to Stacey. You can also select the top menu to collect objects that will be useful later on. There is however a limit to what you can carry so be selective. Your objective is to find some way of getting Stacey out of the lift, and fight your way to safety. You will notice that the fire has started on your view of the City Hall. This will spread across with time, and although the odd fire bucket will slow it down, you've got to move fast. Unfortunately, if you get too close to the fire, you become hot and find it difficult to breathe. This has the effect of slowing your actions. If the fire catches up with you or you get into a burning room, you will be totally overcome, and have to start again. Stacey won't love you much if you fail her. To help in your task, a light will shine on the plan view of the City Hall to indicate your location. Once a room has been visited, it will be marked in color to show your achievement. Use door passes correctly, and consider what items might be helpful in getting Stacey out of the lift shaft. Once you've got her, don't forget to hurry to find a way out. It's not as easy as it seems! Important. To get out, you're going to need a set of numbers, which fit into the code holder you start off with. When filled, this holder must be set to break the security-locked door at the bottom right of the City Hall - and that's a long way! Above Left: Original Spectrum 48k cassette inlay. Above Right: BugByte re-release cassette inlay. SEARCH - Searches the room you are in. Any object that is in the room will be displayed on the upper duck shoot. Select the objects you want to pick up by scrolling the menu and pressing the fire button. DROP - Drops the object selected in the upper menu. USE - Uses the object selected in the upper menu. GIVE - Enables you to give an object to the girl if she is with you. STAY - If the girl is with you, then selecting the picture of her head and this command will instruct her to stay in the room. FOLLOW - When selected in conjunction with the girl's head, will instruct her to follow you. PAUSE - Allows you to pause the game. ABORT - If you select this, the lower menu will flash. If you really want to abort then press the fire button again. This will return you to the start of the game. GUN AND BULLETS: You will find a gun and bullets in the City Hall. Using the gun you can shoot open the interconnecting doors. To do this, select the gun and then select the USE option. It takes two uses of the gun to shoot open a door. Take care, you will only find a small number of bullets, don't get too trigger-happy. DOOR KEYS: These keys are color coded for specific doors. They can only be used in the door for which they are intended. SECURITY CARDS: These are color coded for the doors for which they are intended. N.B. The yellow card is outlined in black. CUPBOARD KEYS: Color coded and can be used to open locked cupboards. MINE PASS AND GEIGER COUNTER: Get these and they will aid you in the mine. You will find many other objects, but you will have to work out how they can help you or hinder you. At last, Max Zorin's plan is revealed. As Bond suspected all along, the evil mastermind of the electronics empire is intent on capturing the silicon chip market. What better way to achieve this than blowing up the disused mine under Silicon Valley and set off the geological faults to send the whole area into the Pacific? Bond enters the old mine to discover the nuclear detonator has been set and time is ticking away. The bomb is in an underground cavern, and the only way to get it out is to be winched down. He needs help - and May Day is the only person strong enough to help him. She may be Zorin's henchperson, but surely she must realize the insanity of it all? He must find her and persuade her to aid him in his effort to save countless lives and the computer world! This is where you take over. You're in the mine, and must use the objects you find and the help you need to defuse the bomb before it is too late! As you run through the mine, use the lift to reach different levels, or climb ropes to get the various items that will be useful. Sometimes you may have to tumble into oblivion, but you can look before you jump. Watch out for the nasty pits - have you got your grappling hook? Will the dynamite blow up the section of rock you want to go through? Have you got what you need to light it? Will time run out, will the Pacific's fish meet Silicon Valley's chips? All this and more awaits you! Important: When you've found May Day, she will set off on another route; meet her at the winching point later on, but make sure you free her before you leave. Your reward for succeeding is a fitting end for such an accomplished super Secret Agent! GET LIFT: If you are standing next to the lift shaft then this command will cause the lift to move to your level. WINCH DOWN: If you have successfully assembled all the winch mechanisms and have rescued MAY DAY then using this command will cause May Day to winch you down to the detonator. WINCH UP: This will cause May Day to winch you up. GRAPNEL GUN: using the gun will allow you to shoot a rope up from your position to whatever is above. You will then be able to jump onto the rope and climb it as normal. When you jump off, the rope will rewind. Take care; you only have a limited number of charges. DYNAMITE AND LIGHTER: Both of these objects can be used in conjunction to blow up certain rocks. GEIGER COUNTER: If you found this in the City Hall, it will then be displayed on screen and will show how close to the bomb you are. CODE NUMBERS: You will find numbers throughout the mine, five of these numbers, used in the correct order, will defuse the detonator. It is possible to find out the correct numbers and sequence. But that is a problem worthy of the best Secret Agent! This level is a nightmare because there are two bugs in this level that will most likely make you want to throw the game cassette out the window. The two bugs in this level are the most annoying bugs in the game. When these bugs occur, you will most likely get heavily damaged and you will have to restart the game. The two bugs involve getting stuck to objects in the level. Let's say you ram a car head-on...Congratulations you are now stuck to a car, your car will be heavily damaged, and you'll have to restart the level. The second bug in this level is similar to the first bug. Let's say the left or right side of your cars are right next to a green wall. Once you are stuck to the wall, you can't get out unless the green wall ends and goes in another direction. If you try to get out of the wall, you will get damaged. On the street there are yellow arrows on the road pointing in a direction. These arrows show you the possible places where Mayday can land. Going across the bridge and picking a landing point from there is a good tactic. When you see a symbol on the road that looks like an 8, that will be one of the possible points where Mayday can land. Pick a landing point where you can easily get to other landing points and hopefully Mayday will land on the landing point you picked. Good luck. You'll need it. The password for this level is QQQQQ. If that password does not work, try CCPHJ as a password. If the CCPHJ password doesn't work try entering QRS21 as a password. If that password doesn't work, then try to beat the first level "Paris Chase". First of all - the menu system. 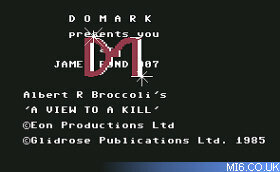 The manual calls this menu the "Duck-Shoot" menu system. Like Paris Chase, this level will make you want to throw the cassette out the window not because of the bugs, but because of the horrible, terrible, poor, abysmal, appallingly programmed menu system. There is at least one major bug in this level. 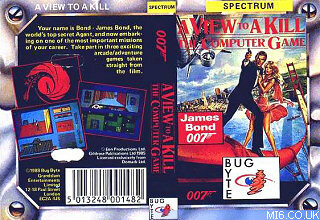 This one bug is when you start the level, whatever you do, the horrible figure of James Bond will not appear on the screen. If this happens, try pressing the fire button and/or moving the joystick around. If that doesn't work, you will probably have to load the game from the cassette again. This menu system has two parts. 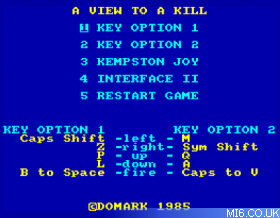 When you use this menu system, first, you must select the object you want to use. Then, press the fire button, and you will be able to control the lower part of the screen. This is where you can do things like restart the mission, abort the mission, give things to people, and other things. Select the action you wish to perform, and if all goes well, the game should perform the action. If you want to go straight to the bottom of the menu system and you don't want to screw around with the objects you have then select the black arrow and it will take you to the bottom of the screen. Say you want to unlock a door and let's also say that the key to unlock the door is in the room you are in. First, you would switch to the bottom of the menu via the method above and select to SEARCH the room. Now, you would have probably gotten a key, pass card, or a similar object to unlock the door. Return to controlling Bond by selecting RETURN on the menu system and go to the locked door you wish you unlock. While facing the door, select the key, and select USE while facing the door. If the door still remains closed try going through the door by simply walking through it or if you are still in control of the bottom of the menu system, select RETURN. Good luck. You'll need it. Like the previous level, there are multiple passwords for this level too. When the password screen asks for the password try the following passwords: QQQQQ, QRS21, or HRMQE. If none of the following passwords work, try beating City Hall. Like City Hall, this level has the same menu system. Unfortunately, this level is not bug free either . It's amazing how many bugs are in this game. This level also tries hard to be like the 1984 Commodore 64 game "Impossible Mission" but fails horribly. The correct combination of numbers to defuse the bomb is 32768. Again, good luck. You'll need it.